The foremost civil society organization: HUMAN RIGHTS WRITERS ASSOCIATION OF NIGERIA (HURIWA) has condemned the incessant political manipulation of the Economic and Financial Crime Commission by the presidency, noting that the Anti-graft commission is rapidly loosing public confidence and is acquiring a notorious reputation as the attack dog of All Progressive Congress (APC). HURIWA specifically condemned the unconstitutional freezing of the bank account of Benue and Akwa Ibom States that are controlled by the Peoples Democratic Party (PDP), just as the rights group described the unending meetings between the Acting Chairman of the Economic and Financial Crime Commission (EFCC), Alhaji Ibrahim Magu and the Acting President Professor Yemi Osinbanjo as nocturnal politically motivated hatchet meeting aimed at marshalling out strategies for witchhunting political opponents of the Presidency. In a media statement authorized jointly by the National Coordinator Comrade Emmanuel Onwubiko and the National Media Affairs Director, Miss Zainab Yusuf, HURIWA expressed displeasure that inspite of the notoriety attracted by Economic and Financial Crimes Commission in the global human rights report issued by the United State of America which affirmed that the Economic and Financial Crime Commission (EFCC) is been used for political witch hunt by the federal government, the Presidency has persisted in the pastime of implementing steps for a direct political manipulation and control for pokitical agenda of the Anti-graft Agency (EFCC). HURIWA expressed shock and consternation that inspite of the fact that the Economic and Financial Crime Commission (ESTABLISHMENT) ACT 2004 enacted by the National Assembly of the federal republic of Nigeria as a legal framework to govern the operations of the anti-graft agency confers some commendable level of operational autonomy and did not envisage that the head of the commission should be turned into a presidential errand boy, on the contrary, the present Administration has converted the acting chairman of the EFCC into a chief servant of the presidency who frequents the offices of the president, the vice president or the acting president (as the case may be) to take instructions on which of the Peoples Democratic Party’s controlled states should be attacked including the illegal freezing of operational accounts of these opposition states. 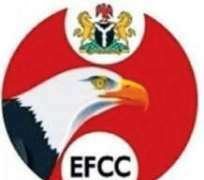 The group stated that these incessant pokitical interferences in the affairs of the EFCC by the Executive arm of government has led to a general perception around the World that the war against corruption and economic crimes been waged by the Presidency is targeted at harassing, intimidating and oppressing the leading political opponents to make it easier for the incumbent administration to enjoy easy ride during the forthcoming general election next year in which the incumbent President has declared intention to run. HURIWA also affirmed that the controversy generated by the open display of partisanship by the acting Chairman of the EFCC who wore the campaign badge of President Muhammadu Buhari to the inauguration of the newly built multibillion Naira worth headquarters had hardly died down before it has again become a notorious fact that the head of EFCC takes regular directives from the Presidency as if the hierarchy of EFCC lacks the necessary competences to administer the EFCC without being teleguided by the politicians in the Presidential Villa who have partisan objective to win the next general election. HURIWA stated that the enabling law setting up the anti-graft agency makes comprehensive provisions for the head of that agency to operate as the chief executive officer and chief accounting officer and wondered why the current government is breaching the law and creating the impression that the EFCC operates at its beck and call. “May we by this statement urge the presidency to stop influencing the operations of the anti-graft body and allow them to effectively go after corrupt public officials.The Current politically motivated attacks directed at the leading opposition political party and the states controlled by the PDP will if not stopped, completely rubbish the integrity of the mechanisms for anti-graft battle”. HURIWA recalled that the enabling law states as follows: Commission shall be responsible for: - the enforcement and the administration of the provisions of this Act; the investigation of all financial crimes including advance fee fraud. Money laundering, counterfeiting, illegal charge transfers, futures market fraud. Fraudulent encashment of negotiable instruments, computer credit card fraud, contract scam, etc. ; the co-ordination and enforcement of all economic and financial crimes laws and enforcement functions conferred on any other person or authority; the adoption of measures to identify, trace, freeze, confiscate or seize proceeds derived from terrorist activities. Economic and financial crime related offences or the properties the value of which corresponds to such proceeds; the adoption of measures to eradicate the commission of economic and financial crimes; the adoption of measures which include co-ordinated preventive and regulatory actions, introduction and maintenance of investigative and control techniques on the prevention of economic and financial related crimes.